Delilah Gutierrez, 10, held a sign during a protest Thursday in San Francisco against President Trump’s immigration positions and policies. The rumors spread quickly, and advocates for immigrants in and around Boston have been struggling to tamp them down. No, there was not a raid at a local school, they tell worried immigrant parents. Yes, you can go to work. No, the photo of federal agents on Facebook was not from a recent arrest here, and, no, there was not a raid at a Somerville restaurant. Massachusetts hasn’t seen the sweeping immigration roundups that have taken place elsewhere in the country. 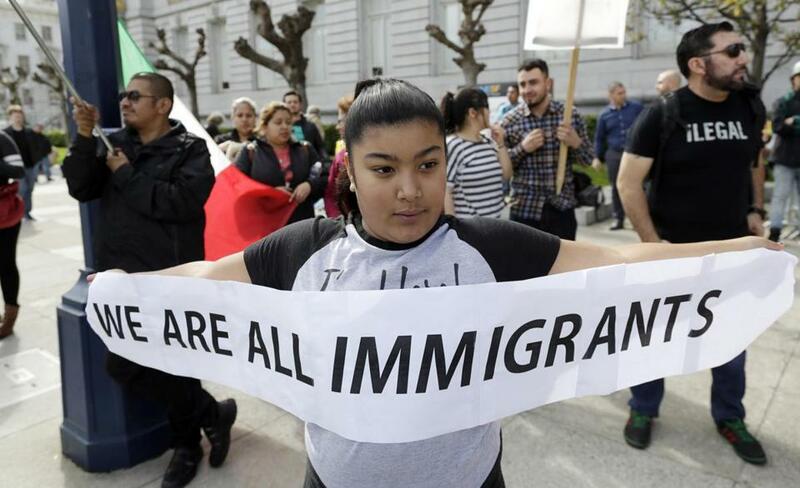 But distrust of the new president, and news Friday that the administration has considered a proposal to mobilize as many as 100,000 National Guard troops to round up unauthorized immigrants, have led to rampant rumors and disrupted lives. “It’s just panic, panic,” said Gladys Vega, executive director of the Chelsea Collaborative, a social service agency in a community where nearly half the residents were born outside the United States. Staffers in the Department of Homeland Security told the Associated Press the proposal to use National Guard troops to round up illegal immigrants had been discussed as recently as Friday. The White House insisted that there was “no effort’’ to implement the idea. Vega, who learned of the proposal from news reports Friday morning, said the news will only worsen the fear in Massachusetts. 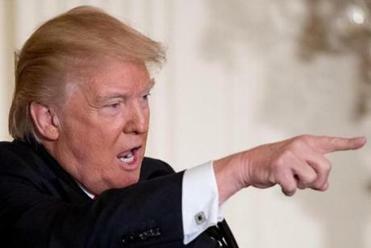 The White House swiftly denied the report that the president is considering mobilizing as many as 100,000 National Guard troops to round up illegal immigrants. Some 210,000 unauthorized immigrants lived in Massachusetts as of 2014, according to a September report by the Pew Research Center. Even before Friday’s disclosure, unauthorized immigrants who are living and working in Greater Boston have been fearful because of Trump’s immigration policies. They are seeking information about their rights, wondering whether it is safe to continue going to work and whether they should close their bank accounts. Some want to know how to protect their US-born children if they are suddenly detained and deported. Boston Public Schools officials said they have seen the concern among the families of students and have been offering “Know Your Rights” workshops for families, in partnership with the Mayor’s Office of Immigrant Advancement. Patricia Montes of Centro Presente, a community agency based in East Boston that helped organize a pro-immigration rally at the State House on Tuesday, said her organization has received calls and heard from residents who are concerned that an immigration raid is imminent or has already happened. The speakers at the Tuesday rally included an 11-year-old boy named Jason, who told the crowd he fears being returned to the violence that he and his mother fled a year ago in Honduras. Another speaker, named Juana, an undocumented immigrant from Mexico who has three children living here, said she is not a criminal but still is in fear. “At any moment, we could be deported,” she said. Last week, raids in cities including Los Angeles, Chicago, and Atlanta led to the arrest and detention of more than 680 people. Officials say that the raids are no different than what occurred under President Obama, whose administration deported a record number of people. Shawn Neudauer, a spokesman for Immigration and Customs Enforcement, said Friday that any reports that there have been large-scale sweeps or raids in New England are only rumors and do a disservice to law enforcement and the public. Kelly said the raids were consistent with Trump’s Jan. 25 executive order to prioritize criminals and immigrants who pose threats. But advocates question whether that has always been the case. For instance, advocate groups cite the arrest of Guadalupe Garcia de Rayos, a mother of two in Phoenix, whose conviction a decade ago for using a false ID to get a job as a janitor at an amusement park was overlooked by Obama’s administration, but not Trump’s. Last week, she showed up at an Immigration and Customs Enforcement building in Phoenix for a check-in with immigration officers and was swiftly deported to Mexico. Last week in Washington state, a man who had been protected from deportation under the Deferred Action for Childhood Arrivals program, which granted work permits and a reprieve from deportation to some immigrants who were brought to the country as young children, was arrested in an immigration raid. Lawyers for Daniel Ramirez have challenged the arrest, saying his status under the DACA program gives him due process rights that were not followed. However, the Department of Homeland Security said in a statement Wednesday that Ramirez is a gang member who was arrested during an operation targeting a felon who had been previously deported, and that his gang affiliations make him eligible for deportation. Ramirez is still being detained, and his lawyers have challenged the claims that he is a gang member. US Representative Joe Kennedy III sent a letter to Kelly on Thursday demanding the Department of Homeland Security publicly outline deportation policies, saying Kelly’s statements so far have been contradicted by examples of arrests, including reports that a domestic violence victim was arrested while filing for a restraining order in Texas. Eva Millona, executive director of the Massachusetts Immigration and Refugee Advocacy Coalition, said in an interview that she has communicated concerns she has heard from the community to law enforcement officials, saying her office has tried to maintain a “working relationship” with regional immigration offices. “Massachusetts has this traumatic experience with 360 families torn apart in New Bedford, and that memory is still present in the communities whose status is in limbo,” said Millona.